 ML Private Investments, LLC was established in July 2008, at the height of the global financial crisis, with the purpose of investing in the domestic and foreign markets through a diversified private investment portfolio. When others had little confidence in the markets, we saw opportunity. The company combines the spirit of enterprise with a business model its founder has used, based on the idea that risk is rewarded if greed is not the driving factor. The company employs a long/short investment strategy using equities and equity derivatives, with an asset allocation that focuses on the preservation of capital without sacrificing the growth of capital. All investments have a defined exit strategy to balance risk and return. The portfolio continues to evolve with the current market conditions.